A crowd of supporters came to Lakport last night to honor Lakeport’s membership in the Lake Village Chamber of Commerce. The chamber and its executive director, Lisa Raby, works hard to support business and tourism in Lake Village–“One of the Delta’s best kept secrets.” We know Lakeport benefits from their support. 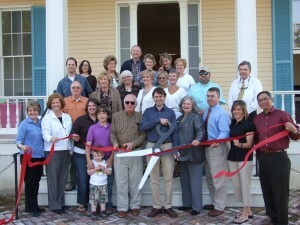 The event was a great success: O’dourves were served on the front porch and beverages were served on the north side porch; a crowd of well-wishers gathered to support Lakeport (and eat); and, most importantly, the scissors cut the ribbon with the greatest of ease. Even though the evening was a success, a swarm of bees in the early afternoon plotted to sabotage the event. 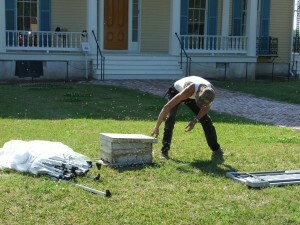 Lucky for us, registered beekeeper, John C. Hatfield, was able to come from Star City to remove swarm. The bees were gone by 4:45–just in time to finish setting up.